We love pizza of all sizes and shapes. My family prefers thin, hand tossed, thick, Chicago Deep Dish crust and more! Some of us love a lot of sauce, others prefer less. Our choice of toppings vary, too and for the most part we haven't found a pizza we don't like. Including in this love of pizza is a crustless pizza idea I tried out on my family. It is bread crustless but still has a crust to hold up the ingredients. It is more of a fork pizza recipe instead of a hold in your hand pizza. Give it a try! What are your family favorite toppings? This pizza is so easy, everyone can make their own pizza! 1-Preheat oven 350 degree oven. 2-Mix the above in a bowl. 3-Lightly grease a 9 x 13 baking dish. 4-Press mixture evenly into the dish. 5-Bake 20 minutes or until it turns light golden brown. 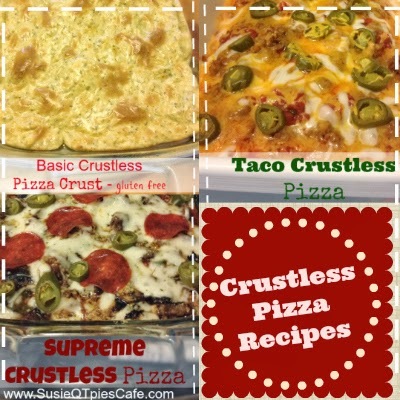 Crustless Pizza Recipes - This is an easy recipe to use your favorite toppings. Once the above crust is done you can add the sauce, toppings & cheese. Substitute any of the below for your own favorites. 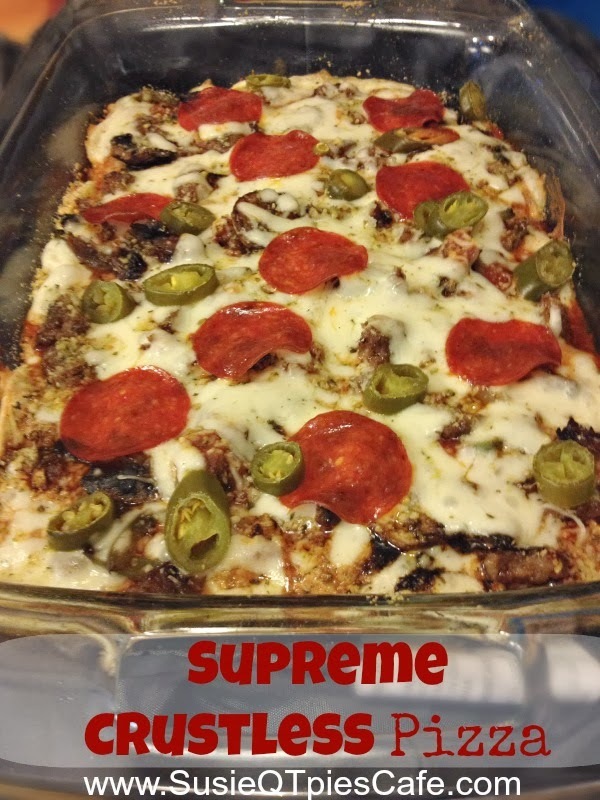 1- On the cooked crust, layer on the sauce, veggies, meat, cheeses and spices. 2- Bake in a 350 degree oven until bubbly at approximately 10-15 minutes. 3- Let cool 10 minutes, cut and serve. This is such a flexible pizza. Use whatever you want and in any combination. For the crust and extra Parmesan cheese on this pizza we used Mama Francesca Parmesan, Basil & Oregano combination. This was a new product in our Walmart and turned out a winner for the crust and as the seasoning. If you don't have such product, just use regular grated Parmesan Cheese. 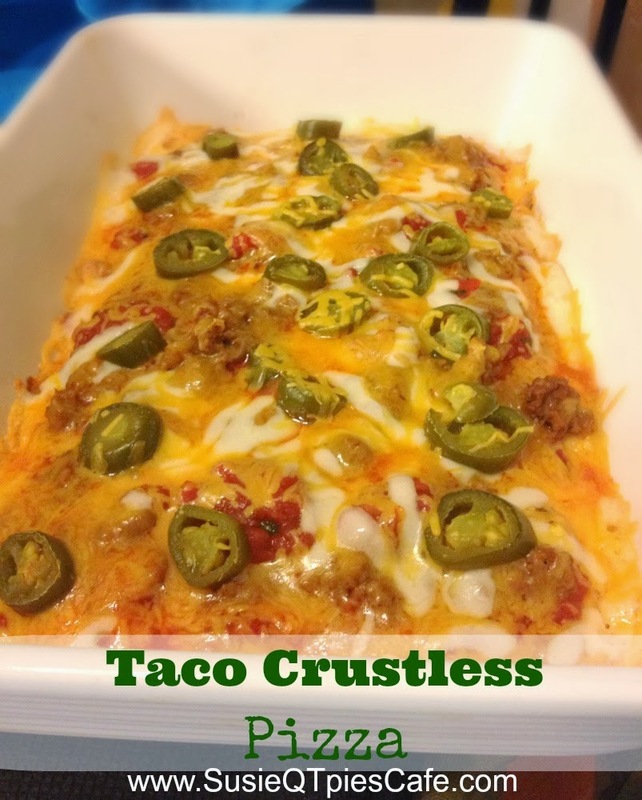 I didn't use this combo cheese for the Taco Pizza below. 1- On the cooked crust, layer on the salsa & sauce, meat, cheeses, veggies and cilantro. 2- Bake in a 350 degree oven until bubbly - approx. 10-15 minutes. 4- Before serving, you could top with fresh tomatoes, shredded lettuce, sour cream, black olives, etc. We didn't do that but plan to next time. I'm giving you heads up on this crustless pizza recipe. You will want to make more than you think. I made 2 pizzas for 5 people (boys/men) and it wasn't enough! Because there isn't any crust to fill people up, more is needed. We love this and can't wait to make it again and again and again. OMGOSH!This saved our low carb diet!!! Unbelievably good. My picky eater husband even loved it! Thank you thank you! 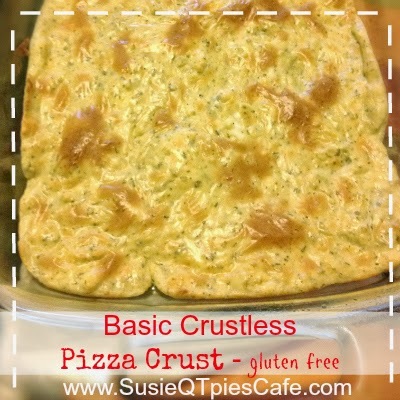 Ok it says crustless but then it says on cooked crust spread sauce, so what are you putting the sauce on?